ython is a functional and flexible programming language that is powerful enough for experienced programmers to use, but simple enough for beginners as well. Python is a well developed, stable and fun to use programming language that is adaptable for both small and large development projects. If you want to learn how to program or want to branch out into other programming languages, our Python for Beginners course is the right course for you. Programmers love Python because of how fast and easy it is to use. Python cuts development time in half with its simple to read syntax and easy compilation feature. Debugging your programs is a breeze in Python with its built in debugger. Using Python makes programmers more productive and their programs ultimately better. In this course, Instructor Alex Bowers will teach you how to quickly write your first program in Python! You will also learn how to create custom modules and libraries. This comprehensive course covers the basics of Python as well as the more advanced aspects such as debugging and handling files. With your purchase you will gain access to all 13 chapters of this course as well as labs and code files. No other Python course is this detailed. Even database operations are covered in this extremely comprehensive course! 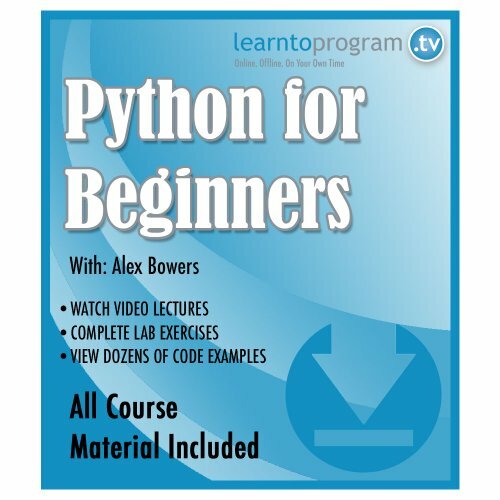 Create stable and more functional programs today with our Python for Beginners course.